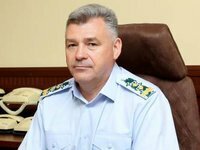 The Regional Maritime Security Administration of the State Border Service, which will begin full work before the end of the current 2018, will take over the entire maritime border of Ukraine in the waters of the Black and Azov Seas, head of the State Border Service of Ukraine Petro Tsyhykal has said. During the events in Donetsk-Luhansk regional office, Tsyhykal noted that in the conditions of the Russian aggression, terrorist threats and the migration crisis, border guards are taking additional measures to strengthen control over the entry into Ukraine, and to cover the territory of Ukraine from invasion from the sea, the sea component is increasing, the website of the border service said on Wednesday. "Until the end of the year, a new Regional Maritime Security Directorate will be deployed, which will take the entire maritime border from Izmail to Mariupol under protection, the ship-and-boat structure will be replenished with new boats," said the head of the State Border Service. As reported, in May of this year, the Ukrainian border guard launched a comprehensive reform of the marine protection, within which a regional department of marine protection was created.